Two readers dropped me emails this week to highlight hotel redemptions they had booked which represented exceptional value for money. I thought I’d share them both today. 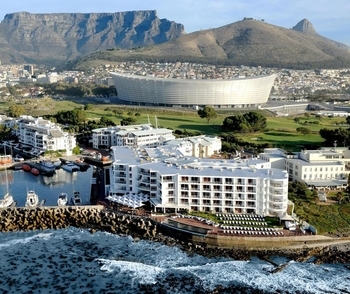 First up is the Radisson Blu Hotel Waterfront in Cape Town, a well regarded hotel with direct sea views (see photo below) near the V&A Waterfront development. A few years ago, Radisson Rewards started offering ‘family rooms’ for redemption. This was a great move, allowing you to pay a few more points in return for a room which would allow you to fit in your children. Radisson Blu Waterfront seemed to take the memo a little too far, however. It offers a two-bedroom sea-view suite as a ‘family room’ redemption. It is 110 square metres. Next Thursday, which is still peak season in Cape Town, a standard room at Radisson Blu Waterfront is £300 per night prepaid. The 2-bedroom suite is selling for £720. I have seen it even higher. For points – look under ‘Redemptions – Family Room’ – it is just 87,500 Radisson Rewards points per night. Remember that Radisson Rewards points convert at 1:3 from American Express Membership Rewards, so you’d only need 29,167 Amex points per night. Note that this room only shows on dates where the 2-bedroom suite is available for cash. If it does not show for cash, a lesser quality room is offered as the ‘family’ redemption option. It will show clearly if you are getting the 2-bedroom suite. Thanks to Cliff for this, who just returned from a stay in the suite. The hotel website is here if you want to find out more. The UK has a number of genuinely high-end country hotels near London – Four Seasons Hampshire, Chewton Glen, Whatley Manor, Coworth Park etc. These hotels have two things in common. They are exceptionally expensive at weekends and they are not available with hotel loyalty points. This is why I am excited by the opening of The Langley. Take a look at its website here. The Langley is as reassuringly expensive as you would expect. Opening at the end of May, the cheapest rooms for a Saturday night in June are £441 and go up sharply from there. For Marriott Bonvoy points, however, it is exceptionally cheap. The Langley is Category 5, which means it is 35,000 points per night. I tend to value a Marriott Bonvoy point at 0.5p. Spend them at The Langley and you’re getting 1.25p+. The hotel website is here. Redeem now if you want to lock in a Summer weekend. Ignore the message on the website about redemptions not yet being available – search and they show. And the Priority Pass 'Lounge of the Year 2018' award nearly goes to ..... Aberdeen! Sadly the website says that the Langley is not taking points bookings at the moment. Any idea when this will open up for redemptions? Seems to be available for redemptions from June 2019. I didn’t get any coming up for May but June weekends are available. The Marriott site defaults to that phrase when there are no award nights available for your dates. It used to show the calendar of available dates to allow you to be flexible but it seems that is broken too! Ignore the website. You can book – I already have. I have 5 nights for 4 booked on points at the Langley for our Anniversary in September. I hope it’s as good as the cash price indicates! With so few rooms it has the potential to be a very personal boutique experience – let’s see. Thank you for the article on Radisson Cape Town. Just out of interest, do you plan to run any articles on the best Radisson Hotel redemptions? I have seen Hilton before. We booked Radisson Orlando Conference Crntre last year but then cancelled after reading there was limited ways to get to Disney without a car. I travel alot in Nordic so Radisson is good for me. And 1 tip for you and fellow readers. When Radisson do there promotions, you can book in advance if you do not know when you need to stay, then adjust/cancel your stay with no issue to get your reward. I hope that makes sense. ie recently I knew I’d probably do 10 nights in Sweden. I booked 10 nights at corporate rates and then moved them as needed. Also, the hotels are very good at cancelling and rebooking you if Radisson state ‘new bookings only’ to achieve targets. There isn’t much interest in Radisson from our readers (page views on Radisson articles are always low) so we tend not to cover them unless it is a great deal, a global promo or a review of a stay. Radisson is also unhelpful. If they offered us review nights at new hotels we’d do them, but they don’t. Having just had my first Radisson stay, with Gold via Amex, staying at Park Plaza Waterloo I can understand a lack of interest if that’s the yardstick. Great hard product but lack of quality with some staff and a struggle to get any loyalty club benefits. Well I can’t argue with the page views, but can confirm that Radisson’s view of a “family room” is often ludicrously large or sometimes basically means two rooms for the price of one. which when combined with the relatively generous 3/1 transfer ratio from Amex, I would’ve thought is of great interest to the many HfPers with both Amex points and families. Their offering in the UK is pretty mixed, but then look at some of the ropey old Hiltons knocking about. Any ideas as to when Marriott Bonvoy are releasing their peak/off-peak dates for 2019 ? I wonder when and how it will work too. Whether they will apply a blanket peak/off peak dates for all hotels and whether each hotel can set the dates. Or even if there is a minimum number of off-peak days etc. It worries me that this will be exploited somewhat by the hotels and the lower “off-peak” award rates will be few and far between. Marriott will set the periods for the area ie local holiday seasons etc will be peak. Ie uk in summer peak but Middle East in summer off peak etc. I was told it will be country wide and not left to the hotels. Probably 100 days peak and 100 days off peak. IMHO summer stays in the Middle East are better serviced with cash. Although if the hotels bring in point breaks at the same time as they’re in an off peak cycle some may be worth another look. It won’t be country wide! That would make no sence in their biggest home market? Maybe city? Having been through the descriptions of each room, the only room type where a rollaway bed is permissable is the Main House Suite. It allows max. one rollaway bed and one cot. Rob, how does it work for booking a room at the Langley for 2 adults & a child with points please?? The base room says no crib/extra bed option…. any other options? Oh dear! Looks like I’ll need to buy a travel cot then! We don’t know, it’s not open yet! Alex – whilst a more expensive option, look at the Baby Bjorn travel cot (we picked up one second hand on eBay) – very good and very light so very easy to travel with (we took it to NZ last year so very helpful). Also works as a play pen during the day! Has anybody stayed at the Radisson or Marriott properties near Disneyland Paris and have a view as to which is a better option? There’s a big difference in cash rates, but Radisson has a family room at 55k points and Marriott has a 2 bed townhouse at 35k points… assuming we use Amex MR then there isn’t a huge difference. Currently undecided whether we’ll get the train (in which case I think Radisson might be better located) or drive (in which case the Marriott may make more sense). I’d be grateful for for any views! You can also stay centrally – remember the RER runs to the park gates and you can pick that up in the city centre. Thank you, hadn’t considered that…. was planning to keep the centre for a different trip though. Will have a look at some other options too. However, children will be 2/5 – so closer to the park is probably preferable, otherwise it’ll be lunchtime before we manage to get there! Make sure it’s not lunchtime! The golden time to avoid the crowds (in pretty much any theme partk but especially Disney) is to make use of every one of the first 90 minutes after opening (which means arriving well before opening time if you are not already holding your tickets). On busy days you will be able to do more in this time than in all of the following 4-5 hours. Far better to arrive early and leave early when kids are tired. Thanks for the post Tob. Just a booked one points night away in August at The Langley….I can only imagine what breakfast will cost! Another cheap article… Another two hotels changing their policy’s soon!! Doubt it would make a difference. Did everyone rush out to reserve Yas rooms in Abu Dhabi? Both properties should be glad of the free advertising if anything. Yas Abu Dhabi will go to a Cat 6 or 7 once it’s upto W brand standards! It’s not there yet! A room at 400£+ with 35k is a fantastic example of maximising value … I have just booked a we stay.. Thanks Rob ! Could you explain the reason for labelling this “cheap”? “Cheap” Another easy article highlighting “sweatspots” which at the same time rob is working with both these companies, both of these have been in comments before. HFP has got so big now as soon as they appear (unless it’s a sponsorship deal) they will be killed within a few days . We have zero relationship with Radisson. Ever seen a review of one of their hotels on here which we didn’t pay for ourselves? Thought not. As I can search the comments and you can’t, let me tell you that the Radisson Cape Town has NEVER been mentioned in HFP comments before today. The only previous reference to The Langley has been in a comment by me and was not discussing redemptions. But don’t let the truth get in the way of a good rant …. I’m not entirely sure what you expect me to do with such bits of news when I come across them, except presumably email them to you directly so that only you can benefit. I’d really like to book the The Langley to get away with the Mrs, but sadly I don’t have any points. Neither myself or my Mrs. qualify for the SPG spend bonus, so I don’t have a way to make 35k points. One option could be to get a relative (same surname) to take out an AMEX SPG card (I would refer them, bagging some MR refer points). I would pay the card fee and use a supplementary card spend the £1k required to generate the 30k welcome points, 3k bonus points and 3k spend points. The million dollar question: could i get my relative to book a one night stay using points and then i turn up with my Mrs? Or is the room booking only for the SPG card holder? I could transfer 23,600 MR points to Marriot, but that doesnt seem like the best way. At a core value of 0.5p per MR, that’s £118. I think I get much more value from MR, so maybe more. Still a c£400 a night stay for £235 of points at the nominal 1p per MR valuation. I’ll confess I have and do spend that sort of money on a couple nights in 5*/Luxury major city/London hotel. Tbh if it’s not as good as we think it will be redemptions are fully refundable. Marriott points can be transferred between two people up to 100k per year (need to call to do it). This would be the cleanest route. And it’s very quick and easy to do! Thanks Rob. Will go this route. Hopefully The Langley is still 35k by the time it gets sorted. If you weren’t going to otherwise earn points by spending the 1k, this would be an option, however your relative would have to open a Marriott account to get the points (or they would open one for her I think). They could then transfer the points to you (after 90 days?) so you could make the booking yourself. Recreation & Fitness at The Langley? Looks like you can fight someone called Matt Roberts – he certainly looks like he wants a fight. Looks very thin, I reckon you could take him Rob! I never understand why people go to he gym on holiday – it’s a holiday!! Matt Roberts is very famous if you live in Mayfair, Chelsea, Belgravia, Knightsbridge, Notting Hill or Kensington. Less so elsewhere but I doubt The Langley is looking much further for its guests. If even I have heard Of Matt Roberts, and i have, then he must be very famous indeed as i’m normally clueless about famous people. I think it runs in Cape Town. It is a very average three stars hotel at best. Sorry, it should have said: I stayed at the radisson hotel in Cape Town. O/T – I’ve also just booked my flight on BA to Tokyo. The flight will be operated by JAL. However I’m unable to book my seats on either the JAL or BA site. I’m a silver member. Appears the only way is to either call them or send send a message on Twitter. This has been an ongoing issue for a number of years now. It’s about time that they try to sort this IT issue.